In a large mixing bowl, dissolve yeast in warm water. Let stand 10 minutes. Warm milk to 110 to 115°F; stir in margarine, honey, brown sugar and salt; cool to lukewarm. Add milk mixture to yeast; add wheat germ, wheat gluten, 2 cups whole wheat flour and 3 cups bread flour. With an electric mixer, beat for 3 minutes. Stir in remaining cup whole wheat flour and additional bread flour as needed to make stiff dough. Place dough on a floured board and knead for 10 minutes or until dough is smooth and elastic. Dough will be slightly sticky to the touch. Place dough in bowl coated with non-stick spray, turning once to coat the top. Cover and let rise in warm place, free from draft, until doubled in size, about 75 minutes. 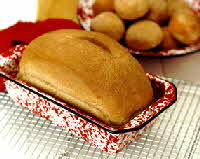 Place loaf in a 9 x 5-inch pan coated with non-stick spray. Cover and let rise in warm place until doubled, about 1 hour. Bake for 35 minutes or until loaf sounds hollow when tapped with fingers. To prevent a dark crust cover loaf the last 15 minutes. Remove from pans and brush with butter. Cool thoroughly before storing. For rolls, bake about 15 minutes or until golden. With 16 slices per loaf, each 2-ounce serving (1 slice or 1 roll) provides approximately: 144 calories, 5 g protein, 27 g carbohydrates, 2 g fiber, 2 g fat (0 g saturated), 0 mg cholesterol, 44 mcg folate, 2 mg iron, 202 mg sodium.